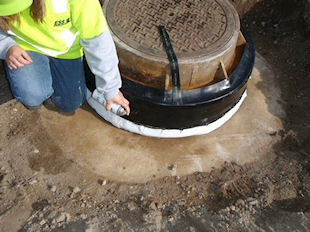 The new improved Infi-ShieldÂ® Uni-band is an inexpensive and permanent method of externally sealing the grade adjustment ring area of a manhole. The one piece molded seal has a reinforced preformed L shaped corner. Accommodating ground movement, Infi-ShieldÂ® Uni-band's high quality rubber and non-hardening butyl mastic provide a flexible water-tight seal around the structure. Infi-ShieldÂ® Uni-band saves taxpayer's money by not having to treat the extra clear water and by avoiding expensive repair and maintenance costs.